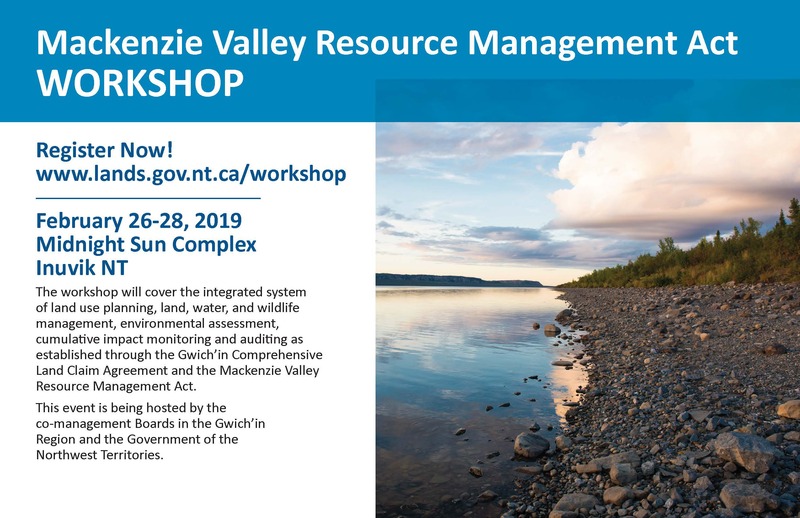 April 9-11, 2019 the Wekʼèezhìı Renewable Resources Board (WRRB), will be holding a Public Hearing in Behchokǫ̀ to discuss the “Joint Proposal on Management Actions for the Bluenose-East Ekwǫ̀ (Barren-ground caribou) Herd 2019-2021” which outlines proposed management actions for the Sahtì Ekwǫ̀ (Bluenose-East caribou) herd in Wek’èezhìı. Coming up April 3, 2019, the Outreach Coordinator for the MVLWB, and the Communications Officer for the WLWB & WRRB will be attending the Career Fair happening at Chief Jimmy Bruneau school in Behchokǫ̀, to chat with grade 11 and 12 students about working in resource management. The event runs from 10 am to 3 pm, and is open to the public. The Tłı̨chǫ Government is currently hiring a Wildlife/Fisheries Biologist for a 2 year term, located in Behchokǫ̀. For further details, please click the hyperlinked job posting. Closing date is April 5, 2019 at 5 pm MT. The Wekʼèezhìı Renewable Resources Board (WRRB) is presently seeking a Wildlife Management Biologist to join their team for a 13-month term (May 6, 2019 to May 29, 2020). If you are interested in applying for this position, please see the hyperlinked job description for details. The deadline for applications is March 22, 2019, by 11:59 pm MT. The Wek'èezhìı ​​​​​​Land and Water Board (WLWB) has received a Type B Water Licence Application (W2016L8-0001) from the Government of the Northwest Territories Department of Infrastructure, for the development of the Tłı̨chǫ All-Season Road to Whatì. Reviewer comments and Notice of Application for Water Compensation are due February 21, 2019. The Wek’èezhìi Land and Water Board would like to congratulate Joe Mackenzie on his appointment to serve a three-year term as Chair. Joe continues to reside in Behchokǫ and practice traditional on-the-land activities. Joe has served on the Board since January 2012 and we look forward to many more!